Hardwood is a beautiful addition to any space. There’s a very good reason as to why hardwood is such a highly popular flooring option, and no, it’s not because it’s the most affordable. The reason why people love hardwood flooring is that it’s beautiful, and it’s the type of beauty that will never go out of style. Hardwood floors also last for years, and since they can be refinished, you can make your hardwood floors look brand new again and again. Unfortunately, hardwood flooring does require a bigger upfront investment than many people have the budget for, but there is good news! There are more affordable alternatives that can help you achieve the look of real hardwood in your home — without the hefty price tag. Here is a list from our hardwood flooring installers in New Jersey of the best hardwood alternatives for your home. When most people think of laminate flooring, they image that gross, plastic stuff that is easily stained and commonly found in older, outdated homes. But, today’s laminate flooring is nothing like that. 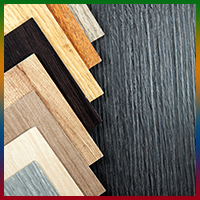 In fact, thanks to modern technology, laminate flooring can be made to look strikingly similar to wood flooring. Even better, when laminate flooring is installed properly, it’s water-resistant, so it’s ideal for spaces where wood flooring is not, like kitchens, bathrooms and laundry rooms. Keep in mind that, when it comes to laminate, not all products are made equal, so do your homework to ensure that you’ve found the best option for your needs. Believe it or not, tile flooring can actually be made to almost perfectly mimic the look of hardwood floors. Mohawk — the leading flooring manufacturer in the industry — uses their own patented technology to create the look of natural hardwood, called Reveal Imaging™. Reveal Imaging creates striking color definition and details you would find in real hardwood, like veining, to make your tile look more realistic than ever before. And, like laminate, as long as it’s installed correctly, tile is completely water-resistant, so you can use it in any room of your home. Vinyl makes one of the best alternatives to real hardwood floors because the upfront investment in vinyl is not only a lot more affordable, but it’s available in planks, which makes it easy to install without the help of a professional, saving you even more money. Vinyl is also resistant to spills and moisture, making it ideal for a much wider variety of applications than real hardwood. 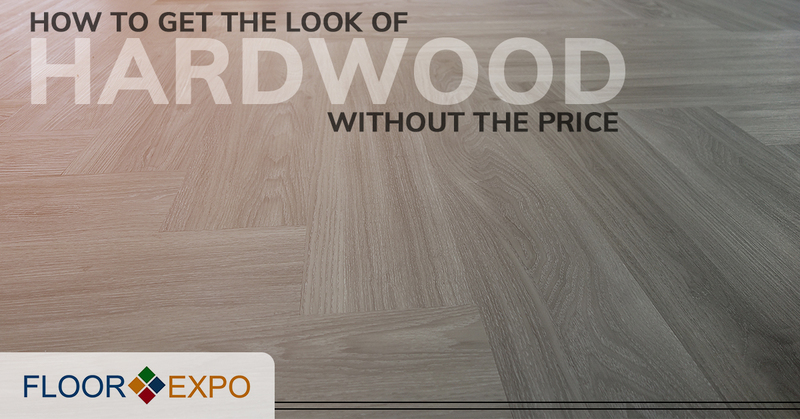 Let the experts at Floor Expo help you find the right wood alternative. As you can see, there are lots of alternatives available when you want the beauty of real wood floors without the price. If you’re in the market for a hardwood flooring alternative, but you’re not sure which option will best suit your needs, contact the professionals at Floor Expo today! We have a huge selection of flooring materials, including real hardwood, laminate, tile, vinyl flooring and much, much more, and you can check it out for yourself when you stop by our flooring showroom in Fairfield!